The Baytems 1553TRC interface card allows a dual-redundant MIL-STD-1553B channel to be easily added to any system with a serial connection to provide a lightweight, small size, rugged, and reliable bus interface. 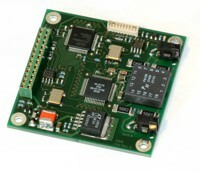 The board can meet rugged levels of shock and vibration, along with a maximum temperature range of -40 - 70 °C. Export controlled item, for availability contact our sales.